Please see the Resources for a detailed explanation of procedures and expectations. -Freedom was so important to the colonists that they were willing to suffer terrible hardships and years of war to win it. -What disagreements led to the American Revolution? -Which people and groups impacted the American Revolution? -How did the French and Indian War change relations between the colonists and Britain? -Why were colonists angered by Britain's new colonial tax laws? -What did colonists do to protest British rule? -How did the colonists prepare for war with Britain? -How did the 13 colonies cut their ties with Britain? Chapter 8: "The Colonies Unite" Review Packet: Be sure to be filling out the review sheet as we are reading the chapter. DO NOT WAIT UNTIL THE END OF THE CHAPTER TO BEGIN THIS WORK. COMPLETING THIS PACKET IS FOR A GRADE. Don't forget: Your user name and password for snap.caboces.org is written in your agenda! Have you ever heard of the Declaration of Independence? How did our country become America? Who originally ruled most of the colonies? Students will engage in text and video surrounding the Declaration of Independence and identify key facts surrounding the creation and signing of the document. Who are some of the key people who helped create this document? What was the reason why the people in the Americas wanted to create this document? How would your life be different if the Declaration of Independence never got written? Do you think that there would have been risks involved if you decided to help create this document? Why is the document and why are these people still so important in our world today? What does it mean by “a group of rebels who became heroes?” Why would this be seen as a good thing now? This section discusses The Tea Party. What trouble do you think was brewing? What can you learn from him and his life story? Even if bad things happen to you, you can still do great things in the future! Students will then watch https://www.youtube.com/watch?v=veLhSRtM548 for a short film of what the real document looks like in Washington D.C. These two pages break up the Declaration of Independence into 3 parts – we will discuss these 3 parts as a class. Miss Morris will address any questions that the students have on the Declaration of Independence - what are the 3 parts that make up this document? Are we celebrating the birthday of America on the wrong day? We will discuss the different dates that independence was almost declared and when it was officially declared. What were some of the challenges that the soldiers in America had to face? What do we know about the colonies from the previous chapter? What is the difference between cause and effect? When do we see these two words? How do they relate to each other? Students will think/pair/share and tell class. Students will Turn to pg. 287 in your text and read “From Strangers to Neighbors” individually or with a partner(s). What caused John Rutledge to travel to New York City? Why were the colonies like different countries? How did learning about the Iroquois League affect colonists? Students will analyze (examine carefully, breaking it into components to understand it) the map on p. 295 in textbook. Students will read p. 296 and identify and explain what the Albany Plan of Union was, and fill in their cause and effect charts. Students will watch a video about the French and Indian war, and fill out a questionnaire that follows along the video. We will go over the questions after the video and this will be handed in for a participation grade. The teacher will model how to fill in Cause and Effect chart. As a class we will complete go over the French and Indian War questions and fill in our Cause and Effect Charts together. Students will think for 3 minutes and about experiences they have had about being under leadership. The teachr will explain the connection between what the students already know and what they are going to learn next. Definition of concept: Identifying effects and reacting and responding to actions taken place. Students will write a letter to King George III, from the perspective of a Native American using p.298 in their textbook as a guide for their thoughts. The teacher will explain what perspective is and how it will be represented in this lesson. The teacher will explain how to format the letter and what is expected from the students to be included in the lesson. She will do this by going over the directions in great detail of what is expected. The teacher will model. What was I thinking when I...? How did I remember...? How did I decide to...? Why did I...? How did I know...? The students will write a letter to King George III in their notebook or on a loose leaf paper and return it to me the next day. What does, “No Taxation Without Representation!” mean? How do the colonists feel about it? What do they want to do about it? Who are the Sons and Daughters of Liberty? What is the Committee of correspondence? Who started it? What year? Scientists use magnifying glasses to get a closer look at things. What do magnifying glasses help you to see? Magnifying glasses help us to see the close details that certain things have. Today we will be doing a close reading exercise that helps us to identify key concepts and details in a text. Definition of concept: Close Reading: helps students critically analyze and identify key concepts and details in the text. Students will participate in a close reading exercise. Students will read pgs. 303-306 in their social studies textbook to give them background on what the Colonists were going through during this time. Questions to answer are posted in the worksheet with directions posted above. The teacher will explain how to answer each of the questions and how students are to cite page numbers with their answers. The students will complete the close reading exercise for homework and turn in to Ms. Taggart the next day for a grade. If day late, the highest student can earn is a 90. - Students will create a Colonist Advertisement- Refer to handout for directions! This was started in class, so it is to be finished at home. Definition of concept: Creating an advertisement from a colonist’s P.O.V. Critical attributes: This allows the students to be able to recognize the importance of protesting and fighting for freedom. Students will review pages 302-313 in the social studies textbook. Students will explain three reasons supporting their point of view. The teacher will explain the directions with great detail and have students analyze what is being asked of them. The students will complete their advertisement and write-up in class and finish the rest at home to be turned in the next day. Name a cause and effect that happened in your life this week. The teacher will explain how to fill out the cause and effect chart. The teacher will check the Cause and Effect chart that students have filled out so far. The students will complete and fill out cause and effect chart with the events we have talked about in class thus far. Read “Magic Pen” play. Come prepared to read the play in class tomorrow and prepare a skit. Question: Think of a time when you were preparing for something. What were you preparing for? Students will analyze (examine carefully, breaking it into components to understand it) a picture on pg. 321 and think/pair/share with their peers about what the image is communicating. Students will take notes on the teacher's PowerPoint. The teacher will go over slides 1-6 in detail. Ms. Taggart will explain each slide carefully in detail. Students will be reminded about their Review Packet that is to be filled out and turned in for a grade by the time of the exam day. The students will read the play, “Magic Pen” for class tomorrow. Students will go up and add their thoughts to the board. EACH student must put one thing down!! Students may collaborate with other students and me if they need to jumpstart some ideas. Students will re-read the play as a class. Students will break into groups (already made by Ms. Taggart) and discuss the author’s purpose and author’s point of view in the play. Students will make appropriate props or materials needed for their interpretation. They are not going to be making props all class! Students will answer the question: “What is the author’s purpose of the play, “Magic Pen”? in RACER format. Mrs. Looney will model how to be vocal with lines. Homework due Tuesday: Complete the Seed Discussion Organizer. This is for a grade. Classwork: Monday. This lesson was taken from the website readwritethink, "Introducing New Content with Seed Discussions." "The Colonies Unite." Can you predict what this chapter will be about? Students will write down their thoughts in their social studies notebooks. What does it mean to unite? Draw a picture or symbol to represent the definition of "unite." We will review the purpose of "features." What features did you use as you drew pictures or symbols to represent the definition of "unite." Students will analyze the photo on page 280-281. What do we observe about the photos? Do these photos pique our interest? Students will search the table of contents in their social studies textbook to find out on what pages chapter 8 is found. Students will peruse pages 292-335 in their social studies book as an introduction to chapter 8: "The Colonies Unite." After students have previewed the chapter, students will fill out the Seed Discussion Organizer individually. Students will receive the Chapter 8: "The Colonies Unite" Review Packet. See above. Be sure to be filling out the review packet as we are reading the chapter. DO NOT WAIT UNTIL THE END OF THE CHAPTER TO BEGIN THIS WORK. COMPLETING THIS PACKET IS FOR A GRADE. Begin looking at and searching for the answers to the questions of the study guide. This will be due in a few weeks before the test. Seed Discussion Organizer: See above for the pdf. Review the meanings of "standard subheadings and inferential subheadings." Review the meaning of "historical significance." Be sure to think about the historical significance of this passage. As a class we will read "We Were Here, Too," adapted from an article by Joan Schonbeck. What does this story tell us about history and point of view? Homework due Friday: Read pages 302-303. Answer the Reading Check question on page 303 in the social studies notebook using the RACE format. Classwork: Thursday. Cause and Effect. Activate Prior Knowledge: What is the effect when you take out a tray of ice and place it on the table? Students will write an example of a cause and effect on a whole page of their notebook. Mrs. Looney will explain the connection between what the students already know and what they are going to learn next. What are the causes and effects of the time period leading up to the American Revolution? Learning Objective: I can identify causes and effects of the time period leading up to the American Revolution. Students will examine the diagram found on page 286 in the social studies textbook. Mrs. Looney will model finding the answer to our key question of the day: What are the causes and effects of the time period leading up to the American Revolution? So what am I looking for? (The cause.) What is the effect? Mrs. Looney will read page 286 and will write down the causes and effects found on that page. She will also write down the signal words. Skill Development: Students will identify the causes and effects. Academic Importance: Does anyone have any other reasons why this lesson is important academically? Personal Importance/Real Life Importance: Does anyone have any other reasons why this lesson is important in your life? You must recycle the question and answer each question in complete sentences. Use the RACE graphic organizer to help you answer your questions. This is for a grade. Homework due Tuesday and Wednesday: Reading Check page 305, and Reading Check page 306. USE THE RACE FORMAT!!! Activate Prior Knowledge: Mrs. Looney is going to ask each student to pay $0.50 each time she gives out a packet or handout. She is going to take up a collection each day from the class. She will decide where the money will go without asking your advice. She wants to buy a new pair of shoes. In your notebook, write down your opinion of this action. Write down feeling words to go along with your opinion. I can develop a rubric to set their own personal goals. I can analyze a drawing and infer its meaning. I can explain the meaning of "taxation without representation." Definition of concept: In pairs, students will come up with a definition of "taxation without representation." Examples: As a class we will come up with examples of what "representation" means. Students will develop a rubric to help them set goals and guidelines to complete a task. Students will analyze (examine carefully, breaking it into components to understand it) the drawing found on page 303. Students will infer the meaning and importance of the drawing. Guided Practice: As a class we will read pages 302-305. Students will make a list of attributes that are included in the concept "taxation WITH representation." Closure: Mrs. Looney wants to make sure that the students are completely prepared for the assignment before it is assigned. Are students able to correctly describe the concept that was just taught? Are students able to tell why it is important to learn the information that they have just been taught? Are students able to complete the skill that has just been taught to them? Independent Practice: Reading Check page 305, and Reading Check page 306. USE THE RACE FORMAT!!! Homework due Friday, : Three Reading Check questions are to be completed using the RACE Graphic Organizer. All three questions need to be completed EITHER on three SEPARATE RACE sheets OR may be completed in your social studies notebook IN PARAGRAPH FORM USING THE RACE FORMAT. Complete the following Reading Check Questions: page 308, page 311, AND page 312. Each question will be for a separate grade. Classwork, Thursday, : Complete the Reading Check Questions using the RACE format. Homework due Thursday, : Students will complete the chapter 8 social studies packet. The worksheets that are included in the packet are: 1) Colonists Speak Out, page 73, 2) The Road to War, page 75, 3) Chapter 8 Study Guide pages 78-79. In total, students will complete the four worksheets found in the packet. Classwork, Wednesday, : Complete the Chapter 8 Social Studies packet. See above for details. Homework due day, day, and day, : None. Classwork, day, day, and day, : Students will identify, list, and explain the causes and effects of the American Revolution. Activate Prior Knowledge: Students will draw a picture in their social studies notebook that shows an example of a cause and an effect. Mrs. Looney will explain the connection between what the students already know and what they are going to learn next. Learning Objective: I can explain the relationships or interactions among people, events, ideas, or concepts in a historical text. I can explain cause and effect relationships. Why did these events occur and what happened as a result? ACTION/REACTION. Apply the concept to examples. Justify your examples using the definition taught. Think/Pair/Share. Skill Development: Students will analyze (examine carefully, breaking it into components to understand it) the BrainPop video Causes and Effects of the American Revolution. https://www.brainpop.com/socialstudies/ushistory/causesoftheamericanrevolution/. Students will identify, list, and explain the causes and effects of the American Revolution. Guided Practice: Students will perform their initial practice step-by-step at the same time as a whole group. First, Mrs. Looney will complete the first step on the SmartBoard and then the students will complete the same step. Gradually, students will begin to do the steps individually. As a class we will complete a graphic organizer that identifies and lists the causes and effects of the French and Indian War as we watch the BrainPop video. NYS SHORT ANSWER QUESTION AND ASSESSMENT CRITIQUE FROM WORKSHOP!!!!! Homework due Friday, and Monday, , : Homework: None. Classwork: Thursday, and Friday, , . First Continental Congress: What would you ask for at the First Continental Congress? Students will break into groups. With their "plume" and "parchment paper," students will gather at the First Continental Congress to complete the tasks below. 2) As a group, decide what steps the colonists should take next. Write down these ideas. 3) As a group, decide which are the strongest grievances to be included in your petition to King George. Discuss why you think they are strong grievances. 4) Individually, decide which three grievances (complaints) are most powerful and need to be included in your petition to King George. 5) In your Petition to King George packet, write down the three grievances (complaints) that are most important to you and that most strongly support your claim. 6) Answer this question: Why are these grievances most upsetting to you? Imagine that you are a colonist who is attending the First Continental Congress in Philadelphia in 1774. Write a persuasive petition to King George III stating your claim and grievances (complaints) of what you have been experiencing lately. Be sure to include at least four facts that explain your grievances. On loose-leaf, using details from Chapter 8, pages 293-313 in your social studies textbook, write a persuasive petition. Write on at least one sheet of loose-leaf paper. Be sure to have someone help you proofread your essay. -Is all of your spelling correct? -Did you capitalize proper nouns? -Did you capitalize beginning of sentences? -Did you put periods, question marks, or exclamation points at the end of your sentences? -Did you indent each new paragraph? -Did you use interesting word choice? -See the rubric for more details of expectations. Homework due Tuesday, Wednesday, Thursday, Friday, and Monday, , : Homework: The Petition to King George Outline is due on Thursday. The Petition to King George must be completed by Friday by the end of social studies class. See above for directions. Classwork: Monday, Tuesday, Wednesday, Thursday, Friday, ,, Petition to King George. We will begin by analyzing a copy of the original document of the Petition to King George. Students will especially search for word choice that they might like to add to their petition. Students will write down these interesting words in their packet. As a class we will brainstorm words that we want to be sure to add to our document. We will fill out page 1 in our Petition to King George Graphic Organizer. See above for detailed directions. Using the list of grievances and complaints that were written in the social studies notebook, students will devise an outline that will guide their writing. Once the outline is complete, students will begin writing their rough draft of the petition to King George III. Students will begin writing the greeting of their document. Students will use page 2 of the Petition to King George Graphic Organizer as a model. DO NOT USE "DEAR" AS THE BEGINNING. Students will write their claim. Students may use the example of a claim found on page 3 of the Petition to King George Graphic Organizer as a model. Students will begin the body of the petition with Grievance #1: NO TAXATION WITHOUT REPRESENTATION! Students will look for evidence from the text to help explain the grievance. Explain the grievance in at least three sentences. Students will then choose two more grievances, find evidence from the text, and then explain the grievance in at least three sentences. Students will continue writing the petition to King George. Homework due Thursday, and Friday, , : Petition to King George Outline is due on Thursday. The Petition to King George must be completed by Friday by the end of social studies class. Please see the Fifth Grade Chapter 8 Colonies Unite page of the website for more detailed directions and resources. Classwork, Wednesday, Thursday, and Friday, , : Petition to King George Outline is due on Thursday. The Petition to King George must be completed by Friday by the end of social studies class. Please see the Fifth Grade Chapter 8 Colonies Unite page of the website for more detailed directions and resources. Students will be typing their petitions in class. Petitions must be completed by Wednesday by the end of Social Studies class. Homework due Tuesday, Wednesday, Thursday, and Friday, , : Students will be typing their petitions in class. Petitions must be completed by Wednesday by the end of Social Studies class. Classwork, Monday, Tuesday, Wednesday, and Thursday, February , : Students will be typing their petitions in class. Petitions must be completed by Wednesday by the end of Social Studies class. Classwork, day , : "Paul Revere's Ride" by Henry Wadsworth Longfellow, pages 288-291 in the social studies text book. Activate Prior Knowledge: Students will draw a picture or list all that they know about Paul Revere. Mrs. Looney will explain the connection between what the students already know and what they are going to learn next. Learning Objective: I can explain the relationships or interactions among people, events, ideas, or concepts in a historical text, poem, or video. I can explain compare and contrast relationships. What are the similarities and differences between the poem and the truth? Skill Development: Students will analyze (examine carefully, breaking it into components to understand it) the poem and the truth. Students will compare and contrast the Henry Wadsworth Longfellow's "Midnight Ride of Paul Revere" to the Discovery Education's video "The Real Ride of Paul Revere." Students will annotate and highlight the parts of the poem that they think are facts. After we watch the videos about the "real ride" of Paul Revere, students will compare what they had highlighted to what is the truth. Longfellow's poem is a fictionalized interpretation of a historical event. What are the benefits and drawbacks of poems as historical documents? Homework due T, : Students will complete the questions on page 317, questions 1-4. These questions are to be completed using the RACE format and answered in the social studies notebook. In class on Friday we read as a class pages 316-317. We interpreted the quotes and discussed the meanings of the quotes. We continued to go over the meaning of "point of view." How the author or person "sees" things. Can be an opinion. Students will answer the four questions on page 317 in the social studies notebook. All of the questions should be answered with the RACE format, except the last question. Homework due Wednesday, and Thursday, , : None. As a class we will go over the homework from the night before. As a class we will read pages 322-329 in the social studies text book. Homework due Friday: Students will reread pages 324-331 and will answer the Reading Check questions found on pages 325, 326, 329, and page 331. All of the answers will be in RACE format written in the social studies notebook. Each answer must have at least 6 sentences. Students will reread pages 324-331. Students will answer the Reading Check questions found on pages 325, 326, 329, and page 331. All of the answers will be in RACE format written in the social studies notebook. Each answer must have at least 6 sentences. We will discuss act out the play "The Magic Pen" about the Declaration of Independence. Homework due Thursday: On loose-leaf, students will answer questions 1-15 on pages 334-335. On loose-leaf, students will answer questions 1-15 on pages 334-335. Homework due day, : Complete the questions on page 299, Review Questions 1-5. Answer questions in the social studies notebook. As a class, we will read pages 298-299 in the social studies textbook. Answer questions 1-5 in your social studies notebook. BE SURE TO RESTATE THE QUESTION, USE QUOTES, AND EXPLAIN YOUR EVIDENCE. Homework due day, , 201: Read pages 304-308 and answer the Reading Check questions on those pages. BE SURE TO RESTATE THE QUESTIONS AND USE THE RACE ORGANIZER TO ANSWER THE QUESTIONS. ALL ANSWERS ARE TO BE COMPLETED ON THE THREE RACE SHEETS! Independently and silently, students will read pages 304-306 and will answer the Reading Check questions on those pages. BE SURE TO RESTATE THE QUESTIONS AND USE THE RACE ORGANIZER TO ANSWER THE QUESTIONS. ALL ANSWERS ARE TO BE COMPLETED ON THE THREE RACE SHEETS! Page 305, Why were the Committees of Correspondence formed? Page 306, What were some of the effects of the Townshend Acts? Page 308, What was the cause of the Boston Massacre? BE SURE TO LOOK AT LUCY CALKINS'S PERFORMANCE ASSESSMENT "BLOOD IN BOSTON: THE MOB PICKS A FIGHT." FOUND IN THE COLONIES UNITE FOLDER IN THE FILE CABINET!!!!!!! Continue where we left off yesterday. Homework due day, , 201: Stamp Act, cause and effect. 1) In your social studies notebook, create and complete a cause and effect graphic organizer after reading about the Stamp Act. 2) Students will fill out the RACE graphic organizer as they answer the Reading Check found on page 303. Why were the colonists angry about the Stamp Act? Using the Cause and Effect Graphic Organizer (found on page 286, and in question 6 on page 299) as a guide, fill in as many causes and effects that you can about the Stamp Act. Students will fill out the RACE graphic organizer as they answer the Reading Check found on page 303. Why were the colonists angry about the Stamp Act? Homework due Thursday, 8, 201: RACE graphic organizer, complete the Reading Check question on page 311. "What caused the colonists to take part in the Boston Tea Party?" Students will analyze the drawing on page 308 in the social studies textbook. How is the drawing similar to the photos in the slide show in the "Take a Stand" video? We will reread the summary on page 308. As a class, we will read pages 310-311 in the textbook. Students will complete the RACE graphic organizer using the Reading Check question on page 311. "What caused the colonists to take part in the Boston Tea Party?" Students will complete the RACE organizer for homework. Homework due Friday, , 201: RACE graphic organizer using the Reading Check question on page 312, "What was the effect of the Coercive Acts?" and page 313, "What did the petition to King George III by the First Continental Congress ask for?" As a class, we will read pages 312-313 in the textbook. Students will complete the RACE graphic organizer using the Reading Check question on page 312, "What was the effect of the Coercive Acts?" and page 313, "What did the petition to King George III by the First Continental Congress ask for?" Students will complete the RACE organizers for homework. Homework due Monday, , 201: Reading Check page 315 and questions 1-4 and question 6 on page 315. We will go over the homework from the night before. We will go over the directions to the Colonies Unite Timeline and Causes and Effects Charts that is due Thursday, . Students will read pages 314-315 in the social studies textbook. Students will answer the Reading Check on page 315, "What were the causes of the fighting at Lexington and Concord?" Students will answer questions 1-4 and question 6 on page 315. There are six questions in total. The questions are to be answered in the social studies notebook. Each question should be answered in paragraph form (complete sentences, recycling the question, using the RACE outline as a guide). Students will review all of the issues that the colonists were facing and how the colonists reacted to these issues.Homework due Tuesday, Wednesday, and Thursday, 13, 14, and 15, 201: The Colonies Unite Timeline is due on Thursday, January 15. We will begin to work on the Causes and Effects Charts on Thursday. The Causes and Effects Charts will be due on Tuesday, January 20. Classwork: Monday, Tuesday, and Wednesday. The Colonies Unite Timeline. Students will follow the directions on the "Colonies Unite Timeline and Causes and Effects" sheet. 1) Utilize pages 296-313 to find the information needed to complete the following tasks. 3) List the dates that the events occurred. 4) Write the main idea of each event. 5) Draw a picture that illustrates or symbolizes each event. 6) USE A RULER! USE COLORED PENCILS, CRAYONS, OR MARKERS. IF YOU HAVE A SHARPIE, PLEASE USE A SHARPIE ON THE WORDS. 7) In your social studies notebook, fill out a cause and effect chart for each of the following terms. Be sure to list as many causes and effects that you can that relate to each term. You may use the charts provided as a guide to the work that you are writing in your notebook. We will work on this together in class on Thursday and Friday, January 15 and 16. Whatever is not completed in class is due on Tuesday, January 20. Homework Due Friday and Tuesday, : Causes and Effects Charts. Completed charts are due Tuesday. This work is to be completed on a graphic organizer or on loose-leaf. Classwork: Thursday, and Friday, , Causes and Effects Charts. Fill out a cause and effect chart for each of the following terms. A chart for each term is found in the "Cause and Effect: The Colonies Unite Packet" found below. Be sure to list as many causes and effects that you can that relate to each term. Use the social studies text book to find the causes and effects of each term. Students will also use the Colonies Unite Timeline Notes to help you with your thinking. We will work on this together in class on Thursday and Friday, January 15 and 16. Whatever is not completed in class is due on Tuesday, January 20.
a. The French and Indian War: 1754-1763, Native Americans fought for both the French and the British, but fought mostly for the French.The War broke out because of disputed land in North America. b. The Sugar Act: 1764, Parliament passed the Sugar Act to raise money to pay off the cost of the war. d. “No taxation without representation!”: 1765, Colonists were angry that they were being taxed because they didn't have representation in Parliament. e. The Townshend Acts: 1767, taxed imports such as glass, tea, paint, and paper. f. The Boston Massacre: 1770, fight between colonists and British. Many believe that Crispus Attucks, who was killed in the Boston Massacre, was the first person killed in the fight for freedom. g. The Tea Act: 1773, gave Britain's East India Company a monopoly on tea. This means that the colonists had to buy their tea from the East India Company. h. The Boston Tea Party: 1773, The Massachusetts governor allowed the ships carrying the tea to enter the harbor. 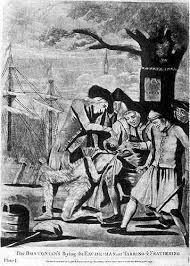 The colonists were not pleased with this and as an act of protest threw more than 300 chests of tea into the harbor. i. The Coercive Acts: 1774, forced colonists to follow laws they felt were unfair. Closed the Boston Harbor. Ordered the British navy to blockade the harbor. Didn't allow legislature to meet. Town meetings had to be approved. Ordered to quarter soldiers. Became known as the Intolerable Acts. j. The First Continental Congress: September, 1774, first meeting of colonial leaders. Met in Philadelphia. Congress sent a signed petition to King George III. Homework Due Wednesday, and Thursday, 21 and 22, 201: Colonist Advertisement. Work on Advertisement assignment. Completed assignment due Thursday. Classwork: Tuesday, and Wednesday, 20 and 21, 201, Colonist Advertisement. Review pages 304-313 in your social studies textbook. Pretend you are a colonist and create an advertisement for a colonist newspaper stating your point-of-view and reactions to one of the topics mentioned on pages 304-313. OR you can pretend to be British and create an advertisement for a British newspaper. Some topics include: the Sons and Daughters of Liberty, the Committees of Correspondence, the Townshend Acts, the Boston Massacre, the Boston Tea Party, the Coercive Acts, and the First Continental Congress. Be sure to use the index in your textbook to find additional information. Be sure that your advertisement is as authentic (real) as possible. You may search the internet for some ideas. DO NOT COPY FROM THE INTERNET. COPYING IS PLAGIARISM AND IS ILLEGAL! Check out the PowerPoint below for additional ideas. Even though color wasn't used much in advertisements in the 1700s, you may want to use color in your advertisement. Use a ruler to make sure your lines are nice and neat. On a sheet of loose-leaf, write one paragraph listing at least three reasons to support your point-of-view. Be sure that you state your claim to introduce your paragraph. -Add details from the text on both your advertisement and on your loose-leaf paragraph. -Use the "Persuasive Words and Phrases" sheet to get ideas for your writing. -Check a dictionary to be sure that all of the words are spelled correctly. -Have someone proofread your work. -Be sure your work is extremely neat. Homework due Friday, 23, 201: Students will fill out the RACE Organizer AND write the answer in paragraph form as they answer the Reading Check question found on page 313. "What did the petition sent to King George III by the First Continental Congress ask for?" Students will share their Colonist Advertisement with the class. In pairs, students will read the section "The First Continental Congress" found on page 313 in the social studies textbook. Students will fill out the RACE Organizer as they answer the Reading Check question found on page 313. "What did the petition sent to King George III by the First Continental Congress ask for?" Individually, students will also answer the question in paragraph form in the social studies notebook. Chapter 8 test: Thursday, . If you complete the study guide, you will do well on the test. Chapter 8: "The Colonies Unite" Review Packet: The review packet was handed out several weeks ago in the middle of the chapter. Be sure to be filling out the review sheet as we are reading the chapter. DO NOT WAIT UNTIL THE END OF THE CHAPTER TO BEGIN THIS WORK. Homework Due Monday through Thursday, , 2015: Students will begin working on answering the questions on the Chapter 8 study guide. STUDY FOR THE TEST!!!!! Use the flashcards that were handed out in class to help you study for the test. TEST IS ON THURSDAY, FEBRUARY 12, 2015. Use the notes that were handed out in class to help you study for the test. Students were given a study guide earlier in the chapter. It is suggested that students study this to prepare for the test. Students were also given a note sheet that is very important to study for the test. Flashcard were also given out in class today. There are links to vocabulary and review questions and games found above in resources. We will finish revising, proofreading, peer editing, and printing our petitions. Homework due Monday through Thursday,: Students will begin working on answering the questions on the Chapter 8 study guide. STUDY FOR THE TEST!!!!! Use the flashcards that were handed out in class to help you study for the test. TEST IS ON THURSDAY, FEBRUARY 12, 2015. Use the notes that were handed out in class to help you study for the test. As a class we will read pages 314-315 and discuss the causes and effects that occurred. We will read and discuss pages 326-331 in the textbook. Lexington and Concord: Shot heard around the world. Beginning of the American Revolution. Battle of Bunker Hill: British realized that it wasn't going to be easy to fight the colonists. Declaration of Independence: document that was written to publicly claim that the colonists were free and independent states. Accepted on July 4, 1776. Written by Thomas Jefferson. Articles of Confederation: first plan of the government of the United States. This plan united the 13 states and held the states together as a nation during the Revolutionary War. Homework due Monday through Thursday, , Students will begin working on answering the questions on the Chapter 8 study guide. STUDY FOR THE TEST!!!!! Use the flashcards that were handed out in class to help you study for the test. TEST IS ON THURSDAY, FEBRUARY 12, 2015. Use the notes that were handed out in class to help you study for the test. We will go over the flashcards, study guide, and notes. We will watch BrainPop videos to review the chapter. Homework due Monday through Thursday, , : Students will begin working on answering the questions on the Chapter 8 study guide. STUDY FOR THE TEST!!!!! Use the flashcards that were handed out in class to help you study for the test. TEST IS ON THURSDAY, FEBRUARY 12, 2015. Use the notes that were handed out in class to help you study for the test. We will continue to review and ask questions to clarify and concepts that are still confusing. We will use this time to go over study strategies. We will practice these strategies. Homework due Friday, , : Make corrections on your test for an improved score. DUE TOMORROW! I WILL NOT ACCEPT CORRECTIONS AFTER HOMEROOM TOMORROW! Test will be on Chapter 8: The Colonies Unite, pages 293-333. Please reference the textbook, class notes, classwork, and homework to prepare for the test. Students have received a review packet in order to prepare for the test. DUE TOMORROW! I WILL NOT ACCEPT CORRECTIONS AFTER 8:00 AM TOMORROW! Homework due Monday,, : EXTRA CREDIT!!! Students will turn in their test corrections to earn an improved test score. Homework Due Tuesday, , : Students will complete the following worksheets for homework: Colonists Speak Out, page 73, The Road to War, page 75, Chapter 8 Study Guide, pages 78-79. Students will complete the four worksheets. Students will working on these worksheets individually and silently. This will take a long time and students will most likely have to take the rest home for homework. This will be for a grade. Declaration of Independence: Central Historical Question: Why did the Founders write the Declaration of Independence? Homework Due Wednesday, , : None. Students will be divided into two groups. In groups, students will read, practice, and perform the short play "A Magical Pen." "A Magic Pen" was adapted from an article by Ruth Spencer Johnson. Homework Due Thursday, , : Write an essay answering the questions below about "A Magical Pen." Each group will perform their interpretation of "A Magical Pen" play. In groups, students will discuss the author's purpose and the author's point of view. Students will reread the play "A Magical Pen." Write an essay answering the questions below about "A Magical Pen." What is the author's purpose of the play "A Magical Pen"? What examples of evidence do you have to prove the author's purpose? What examples of evidence do you have to prove the author's point of view? How can you describe Thomas Jefferson's character traits? What examples of evidence do you have to prove his traits? Students will write three claims: one claim for the author's purpose of the play, the second claim for the author's point of view in the play, and the third claim for the character traits of Thomas Jefferson. In the essay, students will support their claims with evidence from the text. Homework Due Friday, , : Write an essay answering the questions below about the article "Riding for Freedom." Students will read the article "Riding for Freedom." Students will write an essay answering the questions below about the article "Riding for Freedom." What is the author's purpose of this article "Riding for Freedom"? How can you describe Sybil Ludington's character traits? What examples of evidence do you have to prove her traits? Students will write three claims: one claim for the author's purpose of the article, the second claim for the author's point of view in the article, and the third claim for the character traits of Sybil Ludington. Read the Two Historians' Interpretations. Record what each historian believes in the chart that was handed out. As a class, discuss some of the inferences that can be made from these documents. Use the debriefing questions as a guide. Declaration of Independence: Useful notes. Due day, : Homework: Four questions on page 317. Points of View: Who Should Govern the Colonies? Students will read pages 316-317. Break into groups of four. Each group will interpret each of the quotes from colonial leaders. Answer questions 1-3 on page 317 together in class. Then students will answer questions 1-3 on page 317 and the “Make it Relevant” question on page 317. Notes, 314-315, Lexington and Concord. Read pages 314 and 315 in your social studies textbook. Take notes on what you have read. Be sure to write your notes in your social studies notebook. Put the date and page numbers on the top of your page. Write a heading for each section of your notes. Be prepared to share in class what you have learned from your reading. Classwork, day,, 201: Watch School House Rock and Brain Pop. Discuss the similarities and differences in the videos to the notes that were taken last night. Be sure to add any important facts that were mentioned in the video to your notes to enhance your understanding. What are some of the values of watching the simple videos? Classwork, Monday, Tuesday, Wednesday, , 201: The Battle of Lexington and Concord. Central Historical Question: What happened at the Battle of Lexington? "What really happened at the Battle of Lexington? In this lesson, students practice sourcing, corroboration, and contextualization as they weigh competing accounts of who fired the first shots of the Revolutionary War." 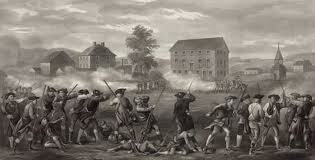 "The Battle of Lexington, on April 19, 1775, is considered the first battle of the American Revolution. Today we are going to try to figure out who fired the first shot." Students will review what was read in the textbook last night. Students will review their notes from the night before. "According to the textbook, who fired the first shot? Did the colonists stand their ground or start to disperse?" Read "Document A: Barker Document" to the class. As the teacher is modeling the annotation, be sure to be annotating on your document as you are reading along. Answer the "Guided Practice" questions together as a class. Using a t-chart graphic organizer, compare information learned in Document A to the School House Rock video, the BrainPop video, and to the textbook. What are some values of the simple School House Rock video? What are some of the drawbacks? Read "Document B: Mulliken Document" with a partner. Answer the "Guided Practice" questions together. These questions will be answered in your social studies notebook. Find similarities and differences in this document compared to the other documents pertaining to the Battle of Lexington and Concord. Go over the "Guided Practice" questions. In groups of three, examine two images of Lexington. Discuss how these images compare to the other documents we have studied. In groups of three, compare all of the documents we have been studying: the videos, the textbook, Documents A and B, and the two images. How can we organize our thoughts? How can we organize this information? Students will write an essay comparing the videos, textbook information, Documents A and B, and the two images. Students will write the essay on loose-leaf. It should be a two to three page essay. Read pages 318-322 in your social studies textbook. Be sure to write your notes in your social studies notebook. Put the date and page numbers on the top of your page. Be prepared to share in class what you have learned in your reading. You have two nights and class time to work on this assignment. Please be sure to put your best effort forward. Classwork: Loyalists Documents A and B. Use this in the Revolutionary War Chapter...Homework due sday, ,: Write a caption for each photo. Write at least five questions for each photo. See below for more details. Looking Closely for Details. "The purpose of the exercise is for students to get a sense of how close examination of texts leads to questions which in turn lead to further examination of textual detail, and an ability to communicate meaning to others." Classwork: sday, , 201: Students will work on the worksheets that were handed out in class on Tuesday. See below. Due sday,, 201: Homework: Complete 3 worksheets (4 pages): Chapter 8 Study Guide, Homework and Practice Book worksheets pages 78-79 AND Colonists Speak Out, Homework and Practice Book worksheet page 73, AND The Road to War, Homework and Practice Book worksheet page 75. Classwork: day, , 201: Students will work on the worksheets. See below. Due day, : Homework: Complete 3 worksheets (4 pages): Skills: Read Parallel Time Lines, Homework and Practice Book worksheet pages 82-83, AND Skills: Tell Fact from Fiction, Homework and Practice Book worksheet page 87, AND Skills: Identify Multiple Causes and Effects Homework and Practice Book worksheet page. Revolutionary War Webquest: BEGIN NEXT CHAPTER BY READING PETITIONS TO KING GEORGE!!!!!!! Due sday, , : Homework: Comic strip with captions. See below for more details. Classwork: , . : Using the notes and questions that you gleaned from the websites, begin your comic strip. Bring the work that you have completed to school on Tuesday so you can work on the comic strip in school on Tuesday. Students will use MacBooks tand/or iPads to complete this assignment. How have my ideas of XXXX changed this week? What have I learned about XXXXX this week? -What have I learned about XXXXX this week? How have my ideas about XXXXX changed this week? Read page 344 and answer questions 1-4 on page 345. This is to be done in your social studies notebook. Complete questions 7-10 on page 370 and questions 15-21 on page 371. This is to be completed in your notebook. Due Monday, : To be prepared for the group work that will take place on Monday, February 11th, each student will need to read the assigned section in the text book and complete the graphic organizer. Any student that is not prepared will not be permitted to work in a group. Due Friday, : Time Line. Read pages 346-361. On the paper provided write a timeline of the important events that are found on the pages you have read. Use a ruler, be neat, use color, be sure all of your spelling is correct. Classwork, Monday , : Students will identify, list, and explain the causes and effects of the French and Indian War. Activate Prior Knowledge: Students will share and explain their diagram/chart of the causes and effects of the French and Indian War that were created over the weekend. Learning Objective: I can explain the relationships or interactions among people, events, ideas, or concepts in a historical text or video. I can explain cause and effect relationships. WATCH THE FRENCH AND INDIAN WAR VIDEO AND WATCH BRAIN POP. How do the videos compare to the information that you found in the text? Make a list of all the information that is listed in both the text book and found in the videos. Skill Development: Students will analyze (examine carefully, breaking it into components to understand it) the BrainPop video "French and Indian War." https://www.brainpop.com/socialstudies/ushistory/frenchandindianwar/. Students will identify, list, and explain the causes and effects of the French and Indian War. Guided Practice: Students will perform their initial practice step-by-step at the same time as a whole group. First, Mrs. Looney will complete the first step on the SmartBoard and then the students will complete the same step. Gradually, students will begin to do the steps individually. As a class we will complete a graphic organizer that identifies and lists the causes and effects of the French and Indian War (the similarities that we read in the textbook compared to what is described in the video) as we watch the BrainPop video. Closure: Mrs. Looney wants to make sure that the students are completely prepared for the assignment before they are to work on their own. Are students able to correctly describe the concept that was just taught? Are students able to tell why it is important to learn the information that they have just been taught? Are students able to complete the skill that has just been taught to them? Homework due Friday, and Monday, , : Identify the causes and effects of the French and Indian War. Devise a chart and/or draw a diagram that depicts the causes and effects of the French and Indian War. Continue reading pages 294-299. Drawing/Diagram is due on Monday on white computer paper. See below for more details. Activate Prior Knowledge: If you eat too much turkey your stomach will hurt. When students arrive in class they will begin analyzing the visuals found on pages 294-295. What caused the British and the French to compete for the Ohio Valley? How did the French and Indian War change relations between the colonists and Britain? Learning Objective: Identify the causes and effects of the French and Indian War. Devise a chart and/or draw a diagram that depicts the causes and effects of the French and Indian War. See below (Independent Practice) for more details. As we move forward in the chapter, students will be thinking about the historical significance and the theme of the chapter. In the social studies notebook, students will use two facing pages and write "historical significance" and "theme" as headings on the top of each page. As we go through the chapter we will make a class anchor chart and students will fill out these two charts in their notebooks. Students will read the guiding questions on page 299 before they read the text. Students will read pages 294-299 in the social studies text book. Students will begin reading about and discussing the French and Indian War. Mrs. Looney will model reviewing the causes and effects that were found in the pages that were read for homework. She will also wonder if any of the effects found on the pages that we are reading can help with our learning objective. She will also think out loud of how she will depict the causes and effects of the French and Indian War. See below (Independent Practice) for more details. Skill Development: Devise a chart and/or draw a diagram that depicts the causes and effects of the French and Indian War.. Independent Practice: Identify the causes and effects of the French and Indian War. Devise a chart and/or draw a diagram that depicts the causes and effects of the French and Indian War. Students will use the detailed notes that we wrote in class during the last two days to create the diagram/chart. Students will use the sixth grade diagrams/charts as examples of what the French and Indian War Causes and Effects diagram/chart could look like. Students will use the notes to provide captions (explanations) for their pictures and symbols. Students may use boxes, arrows, circles, or any other symbols and pictures to explain the causes and effects of the French and Indian War on the computer papers that was given out in class. These charts/diagrams should be as colorful as possible with as much details from our notes as possible. Homework due Friday and Monday, December : None. Classwork, Thursday and Friday, ,: Students will identify, list, and explain the causes and effects of the French and Indian War. Students will compare and contrast the information that they discovered in the videos to the information that we read in the text. Activate Prior Knowledge: Students will draw a picture in their social studies notebook that shows an example of compare and contrast. Mrs. Looney will explain the connection between what the students already know and what they are going to learn next. Learning Objective: I can explain the relationships or interactions among people, events, ideas, or concepts in a historical text. I can explain compare and contrast relationships. How can we compare the information from the text and information that we discover in the videos? Skill Development: Students will analyze (examine carefully, breaking it into components to understand it) the Discovery Education videos and will compare and contrast the information that they discovered in the videos to the information that we read in the text. Independent Practice: Students will watch the second Discovery Education video and will compare and contrast the information that they discovered in the video to the information that we read in the text. As a class, we will create a concept map of the French and Indian War found on BrainPop. Classwork, day: “Take a Stand: Student Activism Around the World.” The video was developed for the United States Department of Education. Homework due Wednesday and Thursday, , : 1)Read pages 298-301. 2) Complete the Reading Check question found on page 299. This is to be completed on the RACE organizer. 3)Compare Historical Maps, page 300, questions 1-4. This is to be completed in the social studies notebook. All questions must be answered in complete sentences. 2) Complete the Reading Check question found on page 299. This is to be completed on the RACE organizer. 3)Compare Historical Maps, page 300, questions 1-4. This is to be completed in the social studies notebook. All questions must be answered in complete sentences. Read page 300 together as a class. In pairs, answer questions 1-4 in your social studies notebook. You must recycle the question and answer each question in complete sentences. YOU WILL REWRITE THE ENTIRE ASSIGNMENT IF YOU DO NOT RECYCLE THE QUESTION AND DO NOT WRITE IN COMPLETE SENTENCES. Also, with your partner, discuss the changes in land claims caused by the French and Indian War. If the class finishes early, we will go over the answers in class. Homework due Thursday, , : Students will complete worksheet pages 71-73. These are for a grade. Students will complete worksheet pages 71-73. These are for a grade. Pages 71-72. Skills Compare Historical Maps. Page 73. Colonists Speak Out. Chapter 8: "The Colonies Unite" Review Packet: Be sure to be filling out the review packet as we are reading the chapter. DO NOT WAIT UNTIL THE END OF THE CHAPTER TO BEGIN THIS WORK. COMPLETING THIS PACKET IS FOR A GRADE. Homework due Tuesday and Wednesday: Write the definitions of the 6 vocabulary words found on page 310 in the social studies text book. Classwork, Tuesday, Wednesday, and Thursday: Students will be typing their essays. Classwork, Friday, and Monday: Students will be writing their essays by hand. Please see the "Champollion Directions," for most of the details to help guide your work. Homework due Wednesday, and Thursday: Two paragraph short answer: Why did we discuss the Women's March? What did you learn? 5.5a The countries of the Western Hemisphere have varied characteristics and contributions that distinguish them from other countries.  Students will explore key cultural characteristics, such as the languages, religions and contributions, of the United States, Canada, Mexico, and one Caribbean or one South American country.  Students will examine the basic structure of the United States federal government, including the president, Congress, and the courts. 5.6c Across time and place, different groups of people in the Western Hemisphere have struggled and fought for equality and civil rights or sovereignty.  Students will examine at least one group of people, such as Native Americans, African Americans, women, or another cultural, ethnic, or racial minority in the Western Hemisphere, who have struggled or are struggling for equality and civil rights or sovereignty. 5.6d Multinational organizations and nongovernmental organizations in the Western Hemisphere seek to encourage cooperation between nations, protect human rights, support economic development, and provide assistance in challenging situations.  Students will examine multinational organizations and nongovernmental organizations and their roles in promoting cooperation, peace, and cultural understanding. What steps did the colonists take to express their opinions to Britain? The Colonists did not have these freedoms nor the protection of the Constitution. Mrs. Looney will explain why the Women's March is relevant to Chapter 8 "The Colonies Unite." We will discuss how different parts of the Women's March fits under the First Amendment to the Constitution. Classwork, Friday: Themes in the life of Dr. Martin Luther King, Jr. Homework due Tuesday: Students will write two paragraphs in their social studies notebook describing character traits of Dr. Martin Luther King, Jr. USE THE RACE FORMAT!!!!! Classwork, Monday: Character Traits of Dr. Martin Luther King, Jr. Homework due Wednesday, Thursday, and Friday: Guiding Questions 1-4: Stamp Act Packet. Work on each question that we discussed in class. This is for a grade. See below. As a class we discussed all of the answers in detail and discussed the expectations as to how many details and pieces of evidence are necessary to answer the questions. All questions are to be answered in your social studies notebook. THERE IS NO HOMEWORK FOR MONDAY! **Please note: information for the following lessons and documents were taken from the Stanford University History Education Group, Reading Like A Historian. I can identify reasons why the colonists were upset about the Stamp Act. I can identify words from the primary source document that leads me to infer what the point of view is of the author of the text. Guiding question: Why were the colonists upset about the Stamp Act? Students will read along as Mrs. Looney reads Stamp Act Document A from the Boston-Gazette, October 7, 1765. Students will annotate in the margins and throughout the text as the text is read aloud. The activity will be repeated for the Stamp Act Document B from the Boston-Gazette, January 27, 1766. Students will re-read the passages and will think about the following question as he/she reads the passage independently, "What words or phrases stand out to me as I read? Why do these words stand out?" Paraphrase some of the details that are noticed. See below for more details. As we read the texts, ask yourself the question, "What information or ideas does this text present?" What is the point of view of the author of each document? How do you know that? One student will read the Stamp Act Document C, written by John Hughes, Stamp Distributor, Philadelphia, January, 13, 1766. The student will pretend to be John Hughes. In pairs, reread the document. Answer the questions on the Guiding Questions sheet. Guiding Questions 1-4: Stamp Act Packet. Work on each question that we discussed in class. This is for a grade. As a class we discussed all of the answers in detail, and we took bulleted notes in the packet. We discussed the expectations as to how many details and pieces of evidence are necessary to answer the questions. All questions are to be answered in your social studies notebook. Use the RACE Format to answer the questions in paragraph form. Due Wednesday, , 201: Homework: Petition to King George graphic organizer. Classwork: Tuesday, , 201, Petition to King George. Students will watch the "Take a Stand" video. We will go over the original petition written to King George III. We will talk about the author's purpose of the petition to King George. Students will circle persuasive words found in the original document. Students will write these words in their social studies notebook. We will review the meaning of opinion and judgement words. In their social studies notebook, students will write down their opinions about the taxes and the petition. In pairs, students will discuss their opinions about the taxes and the petition. Students will decide what their purpose is for their petition. Students will write their purpose in the form of a claim. Which grievances will the "colonists" (students) be articulating to King George? The "colonists" will include opinions in their grievances. Be sure to use judgement words. Using the graphic organizer, students will write evidence to support their grievances and claim to King George. Use pages 293-313 in your text book to find details to support your claim. Using the Module 3, Unit 3, Lesson 3 graphic organizer models as guide, students will decide which organizer they think will be more powerful to use to write the petition: Chronological Order Graphic Organizer, or the Order of Importance Graphic Organizer. As a class we will read parts of the original petition to King George III to get ideas about what to include in our petition. When we write our introduction we will use the same greeting that was used on the original petition. In pairs, students will read parts of the petition and circle words they would like to use in their petition. Students will write these words in their packet. Homework due Tuesday, and Wednesday, , 201: Theme Story due in your notebook. At least four pages written in your writing notebook. (At least two pages written on loose-leaf if the student decides to write the story on loose-leaf.) I recommend that the students write the story in their writing notebook since we will not share these stories until after the NYS math test. I don't want the students to loose their work. They are welcome to turn it in as soon as it is completed. MAKE CORRECTIONS TO YOUR MISTAKES ON PAGES 334-335, questions 1-15 in your social studies text book. ELA Packet (six questions including one essay) due on Thursday morning at 8:00. Also, begin reading the "Remembering a Forgotten President" article and the article "The Winter of Red Snow: The Diary of Abigail Jane Stewart" written by Kristiana Gregory. Answer all of the questions in the packet and write the essay. USE THE RACE FORMAT ON ALL OF THE SHORT-RESPONSE QUESTIONS AND THE ESSAY!!! Due Thursday morning at 8:00. Homework due Wednesday, 7, 201: None. In the social studies notebook, students will make two columns: What I Notice and What I Wonder. Do this exercise the Tuesday in the Last Week in December in writing class!!!!! Due day, , : Homework: Complete t-chart on loose-leaf.